Staghorn and Elkhorn ferns are two of the most dramatic ferns, they look tropical, however are actually easy to grow in a range of climates. Grown for the fascinating foliage Elkhorn and Staghorn Ferns are shade lovers and grow well mounted onto trees, or backing boards. They do require moisture although if you are growing them in cooler climates you will need to keep them a little out of the weather in winter. Neither species likes the combination of cold and wet. 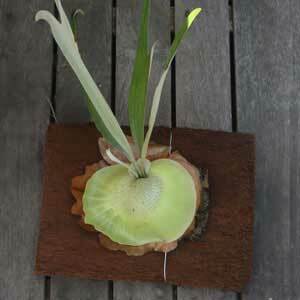 Platycerium superbum or Staghorn Ferns are native to the rainforests of NSW and QLD. 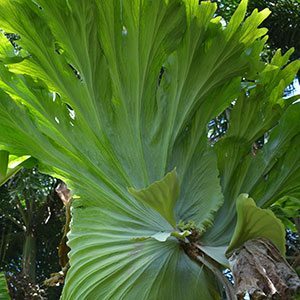 The Elkhorn Fern or Platycerium bifurcatum is native to New Guinea and has smaller fronds. Licensed suppliers offer a range of both small and mature specimens for sale online. The Staghorns are the larger of the two and tend to be solitary plants. Elkhorns are easier to grow, they are more clump forming. Both capture nutrients and moisture through the foliage. Often grown tied to trees, in areas with hot dry summers they are better where they will receive some moisture. You can use a shade house, or simply be diligent with the watering regime. Staghorns Ferns and Elkhorn Ferns are epiphytic ferns that are usually mounted onto timber such as Tree Fern, Marine Ply, Jarrah or a synthetic backing. Remember that these are epiphytic plants and do not develop large root systems. Best grown in light shade and kept moist, but not wet. Little or no fertiliser is required, these plants grow on the detritus collected from the trees they grow beneath. You can use a soluble fertiliser once or twice a year if you wish. A liquid seaweed fertiliser is usually sufficient. Licensed supplier of staghorn ferns in the Northern Rivers from pups to large plants.